Cocktail Audio X30 uses an optical disc drive (ODD) with a 24x high speed. The operation is silent, which means you can listen to music while ripping. 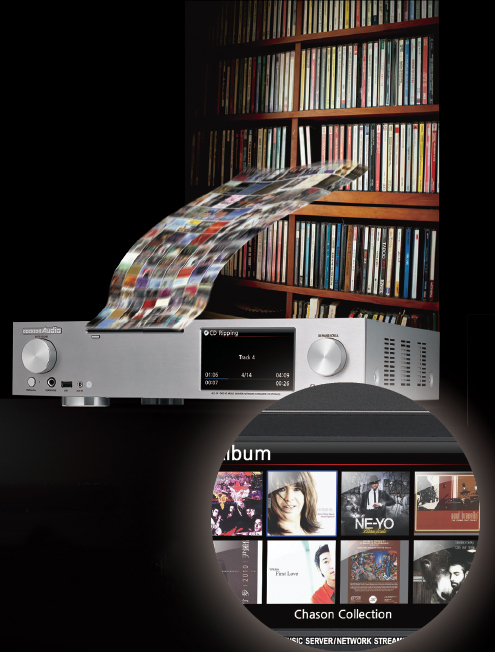 Compatible with CD, CD-DA, CD-R, CD-RW and DVD-R/RW. Cocktail Audio X30 features the well-known Burr-Brown PCM1792A DAC, TCXO oscillator and an isolated power source circuit designed for digital and analogue sound rendering. Cocktail Audio X30 can rip a one hour playing time CD in less than 10 minutes. It will catalogue your collection by album, artist, genre and year - all ripped CDs will be stored into the music database. X30 provides four ripping options (encoding): WAV, FLAC, MP3 or OGG. With a ‘800x480’ pixel 5inch colour TFT LCD screen, CA X30 provides an intuitive GUI (Graphic User Interface) with bold icons and text information – for ease of use and configuration. Cocktail Audio X30 provides HDMI OUT connector for external display, such as a TV (or a compatible monitor) as its GUI screen. Cocktail Audio X30 offers various audio inputs and outputs for connecting other audio devices including a monitor (only HDMI). Three digital outputs, two analogue outputs, two digital inputs and two analogue inputs, allows high connectivity with multiple devices. The dual digital inputs means the CA X30 can be used as a DAC with other digital audio sources. Cocktail Audio X30 is equipped with a high-performance DSP chipset (700mhz MIPS host CPU) with the exclusively developed in-house software (firmware), that supports formats such as wav, flac, alac, pcm, mp3, wma, m4a, aac, aiff, aif, ogg vorbis and playlist (pls, m3u), including high resolution (24bit/192khz) flac and wav files. Cocktail Audio X30 (gapless mode) plays back multiple tracks without gaps, a useful feature for opera and live music fans. Cocktail Audio X30 provides three digital outputs, such as TOSLINK, COAXIAL and AES/EBU XLR, which supports up to 24bit/192Khz. This means the X30 can be used as an audio server and a source device for those wishing to use an existing external amplifier and DAC. A TI high-performance stereo digital amplifier chip, isolated power source circuit design and TCXO oscillator – with low noise and low distortion – makes CA X30 an ideal hi-fi component for an existing bookshelf or high quality floor standing (power load) speakers. Cocktail Audio X30 features an FM tuner (tuning range FM87.5 - 108MHz) with RDS support. (NB RDS support is only available in Europe). Equipped with Gigafast Ethernet (10/100/1000Mbps) and wireless network (Wi-Fi USB dongle optional) you can connect the X30 to your home network to access tens of thousands of radio stations (Reciva) and online music services such as Simfy. With the X30 you can record from the internet radio, FM radio and line-in as well as cassette tapes and vinyl. The 24bit/192Khz ADC chip allows for high resolution recording for better sound quality. 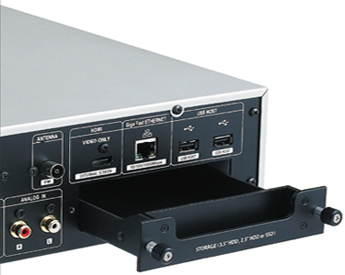 Cocktail Audio X30 supports 3.5” SATA hard disk, 2.5” SATA hard disk or solid state drive (SSD) as storages. A customised storage drive bay (drawer/caddy) allows for quick and easy installation. Using SSD storage means the X30 will operation noiselessly as the device is fanless. CA X30 currently supports up to 4TB of 3.5” hard disk, 1TB of 2.5” hard disk and 500GB of SSD. Increased capacity will be supported by impending firmware updates. 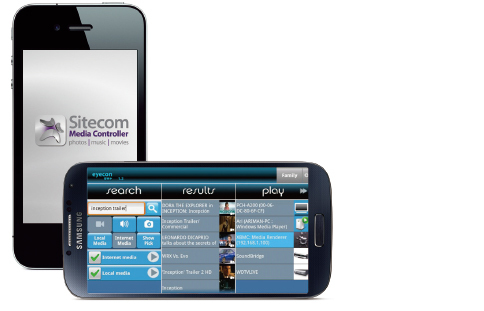 A free app is available to control X30 using a smartphone, tablet or PC. We recommend ‘Eyecon’ for Android and Kinsky’ for iOS. Some music programs that enable streaming via computers can also be used. The Web Interface (Web UI) for various browsers, including Internet Explorer, Firefox, Crome and Safari. With the Web UI you can manage the music database and edit CD metadata, such as adding or changing an album cover art. With the control panel you have quick access to basic functions such as power, volume/mute, OK/pause/scroll, and four menu keys forGUI of LCD screen. The input selector key allows you to seemlessly switch between input devices, and also features a mute mode that can be toggled at the push of the volume knob.